Democratic Rep. Alexandria Ocasio-Cortez is off to a scandalous start to Congress consumed by hateful rhetoric and a clear lack of command for the facts. But by far her biggest transgression was when she threatened Don Trump Jr in a blatant abuse of power. Our system of laws is fragile and we cannot have politicians abusing their power to go after their political enemies. So while the left just says it is her inexperience, she knows better as evidenced by her retreat and apology. 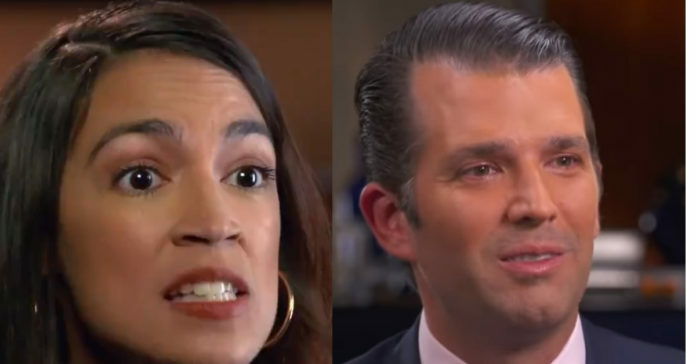 From The Daily Caller: Host Anderson Cooper said some people saw her comments as an abuse of power and Ocasio-Cortez said she was sorry if it made Trump Jr. feel threatened. “Yeah, I’m breaking all the rules,” Ocasio-Cortez said. 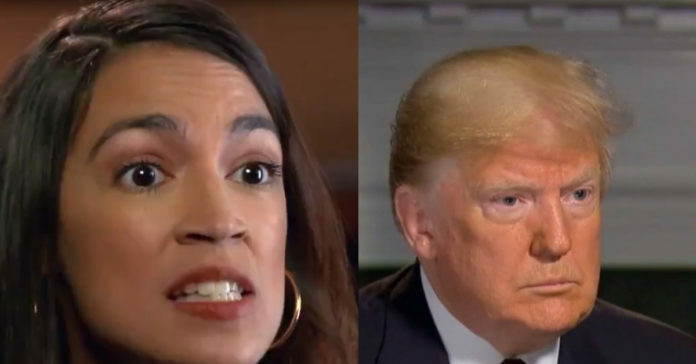 There is “no question” that President Donald Trump is a racist, New York Rep. Alexandria Ocasio-Cortez said in an interview that aired Sunday night. “Do you believe President Trump is a racist?” Cooper asked. “Yeah, yeah, no question,” Ocasio-Cortez replied. “When you look at the words that he uses, which are historic dog whistles of white supremacy. When you look at how he reacted to the Charlottesville incident where neo-Nazis murdered a woman, versus how he manufactures crises like immigrants seeking legal refuge on our borders, it’s night and day,” she continued. 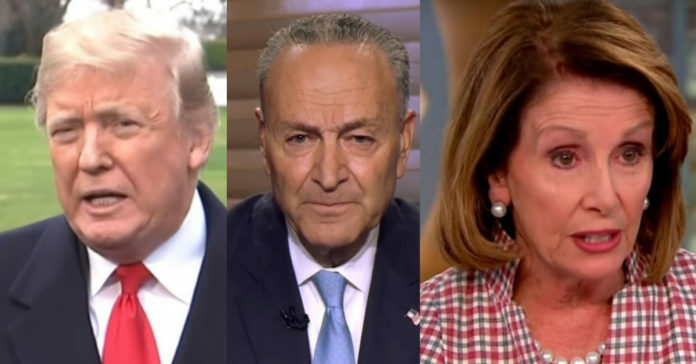 The media and the Democrats have lost their minds over Trump’s threat to call a national emergency to end the government shutdown. The Democrats reactions have been either outright horror, calling Trump a dictator, or just terror induced anxiety quelled by publicly hoping that Trump is bluffing. He is not bluffing and moreover, he is nothing close to a dictator unless Bill Clinton, George Bush and Barack Obama were dictators. The facts are quite simple – we have checks and balances and over the last 40 years the executive branch has grown bolder in asserting its power. Both sides have done this and both sides have found ways to justify executive power expansion. 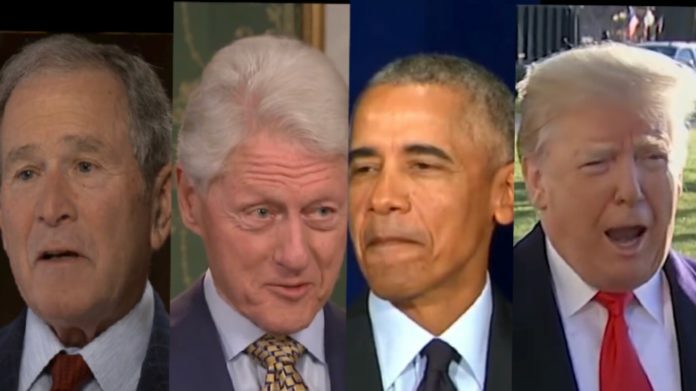 George W. Bush declared 13 emergencies and Barack Obama declared 12 — nearly all of which are still active today. Bill Clinton declared 17 national emergencies, six of which are still active. Ronald Reagan declared six and George H.W. Bush declared four — but all of those have been revoked by now. Presidents must renew national emergencies every year because the statute lets emergencies automatically expire after one year. Past emergencies have focused on everything from swine flu to rough diamonds. President Trump will soon lay down his ace in the hole and there are a few things to keep in mind because the left will go crazy when he declares a national emergency to get the wall done. We currently are operating under 28 separate national emergencies, some are still in force from Bill Clinton’s years. Shocking but true. It seems presidents often use these powers… so when they whine about Trump remember their hypocrisy. There are currently 28 concurrent active national emergencies in America — there’s been at least one national emergency for nearly four decades straight. Declaring a national state of emergency under the National Emergencies Act of 1974 outlines how a president can activate special statutory power during a crisis. The first declaration under the National Emergencies Act of 1974 came during the Iran hostage crisis — a national emergency that is still active today. Jimmy Carter blocked Iranian government property from entering the country. It’s been renewed each year by all presidents since then. Trump said he could keep the shutdown going for years, if needed, and turned down Pelosi’s sneak attempt to pass specific bills to keep specific parts of the government open. Trump said it is all or nothing before dropping the hammer – Trump informed them he could simply declare a national emergency and get the wall funded that way. From ABC: President Donald Trump is seriously considering potential options to circumvent Congress, including declaring a national emergency, to reprogram funds from the Department of Defense and elsewhere to help pay for parts of his desired border wall along the U.S.-Mexico border, according to multiple sources familiar with the ongoing discussions. Sources tell ABC News the discussions are still on the “working level” adding that there’s a range of legal mechanisms that are being considered before such a decision is announced. The discussions have intensified as the president is now 14 days into a partial government shutdown, facing newly empowered House Democrats who are refusing to budge issue of wall funding. The administration is holding meetings Friday, through the weekend and into next week, to continue discussions on next steps, according to officials. It was not immediately clear who would be part of those meetings. On Friday, the president said he had had a “productive” and “very, very good meeting” after talks with top Democrats and other congressional leaders at the White House in an effort to end the partial government shutdown now heading into the third week. Rep. Alexandria Ocasio-Cortez’s fifteen minutes of fame are about up and now comes the infamy. Her tax plan has been soundly rejected by most sane observers but she still persists and it will define her. 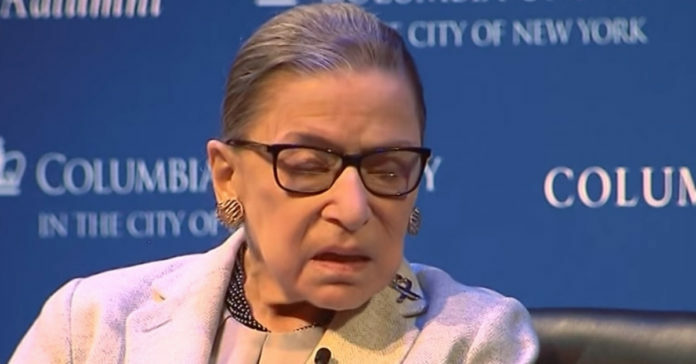 She is out of her depth but that won’t stop her – she has to pay back the radical left who put her there and that, of course, includes taking scandalous shots at Trump. The government shutdown continues with no end in sight and the Democrats have been exposed as hypocrites. They have voted for the wall in the past and will not again unless they get something major in return – that is what we know. So Trump asked for a downpayment of $5 billion – paid now rather than never. For that is what the government would do – they would stall and hide and the money would never be earmarked for the wall. So Trump wants a good faith move by the Democrats now, before they get down to the real negotiation – DACA for the full wall, or whatever grand deal is to be had. It seems reasonable that Trump would want proof in the form of an upfront commitment from the left before he moves another inch. Which makes the nonsense Pelosi is throwing out there that much more obnoxious. 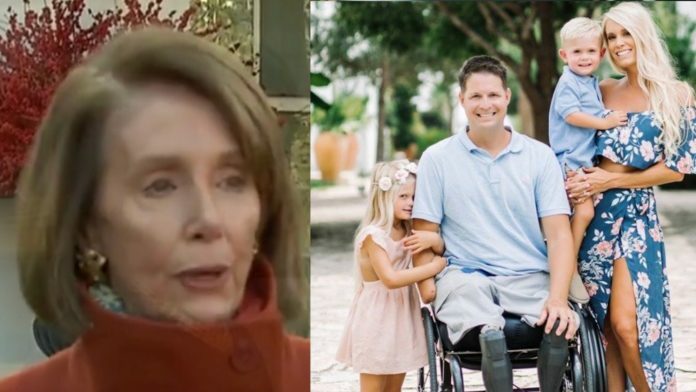 So Brian Kolfage, a triple-amputee veteran and founder of the “We The People Will Fund The Wall” campaign, decided to try to go collect the buck. “We’re taking one dollar at a time to build that wall,” he said. In fact, Kolfage’s campaign has raised $19,294,995 of a $1 billion goal from 319,896 people in 20 days. Tom Fitton and Judicial Watch have been very busy over the years trying to hold the left to account. They don’t always win, but their record as of late is astonishingly good and they just scored another huge win in California and how the state maintains its voter rolls. Our democracy depends on fair elections and clean voter rolls are essential to ensure that our elections remain clean and fair. From The Free Beacon: California and Los Angeles County have agreed to purge as many as 1.5 million inactive voter registrations across the state as part of a court settlement finalized this week with Judicial Watch, a conservative watchdog. 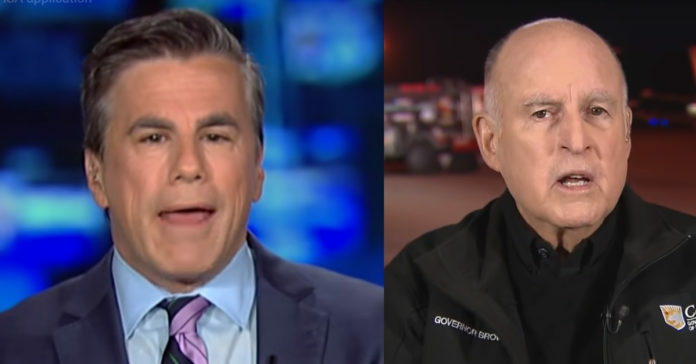 Judicial Watch sued the county and state voter-registration agencies, arguing that the California government was not complying with a federal law requiring the removal of inactive registrations that remain after two general elections, or two to four years. Inactive voter registrations, for the most part, occur when voters move to another country or state or pass away but remain on the rolls. The lawsuit alleged that Los Angeles County, with its more than 10 million residents, has more voter registrations than it has citizens old enough to register with a registration rate of 112 percent of its adult citizen population. The entire state of California had a registration rate of 101 percent of age-eligible citizens, the lawsuit said, citing data published by the U.S. Election Assistance Commission. The settlement is a third statewide voter-registration legal agreement or court order reached between Judicial Watch and states; the others were reached with government entities in Ohio in 2014 and Kentucky last year. “This settlement vindicates Judicial Watch’s groundbreaking lawsuits to clean up state voter rolls to help ensure cleaner elections,” Judicial Watch President Tom Fitton said in a statement. “Safeguards remain in place to ensure voter-list maintenance procedures are followed before canceling any voter registration records,” Padilla said in a statement. He also took a shot at Judicial Watch, arguing that the group’s statements about the settlement “conflates their unfounded claims with what was actually agreed upon in the settlement” but did not elaborate about what constituted an “unfounded claim” by the conservative group. “The settlement is clear and simple: California will continue its work to adhere to modern list maintenance procedures under the [National Voter Registration Act],” he said. 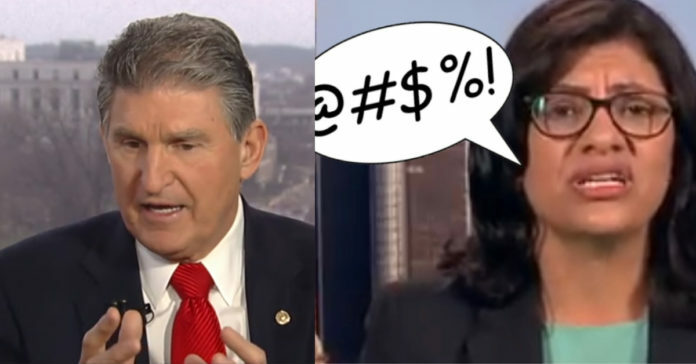 Joe Manchin just weighed in on the filthy impeachment rant that came from a freshman Democrat on her first day in office. It stunned the nation for its viciousness. Speaking to Neil Cavuto Manchin ruined what is left of Rashida’s reputation. Trump destroyed the hapless Democrat as well calling her an absolute disgrace. “I thought her comments were disgraceful. This is a person that I don’t know. I assume she’s new. I think she dishonored herself and I think she’s dishonored her family,” Trump said. The corrupt and career politicians are out of touch with America and we need a radical overhaul to solve this crisis of confidence. The founder’s intended citizen politicians would serve a few years and they go back to private life – they never envisioned what we have now. Career politicians milking the republic for every last cent they can, using the corrupt revolving door from politics to lobbying, to enrich themselves and corrupt the system. It is a disgrace and while we elected Trump to clean it up he needs help. Enter Ted Cruz. With Washington shutdown due to career politicians playing games to score cheap political points, Ted Cruz discovered the easy to end this charade once and for all. To be sure both sides of the aisle share some blame for the gridlock but more than anything it comes down to political cowardice. Greed and cowardice are the coins of the realm and without them, you will not succeed in the swamp. We will all pay a heavy price for the weakness of our leaders. Ted Cruz has a workable solution to the problem and one that will damage the swamp beyond repair. It’s time. From Cruz For Senate: “U.S. 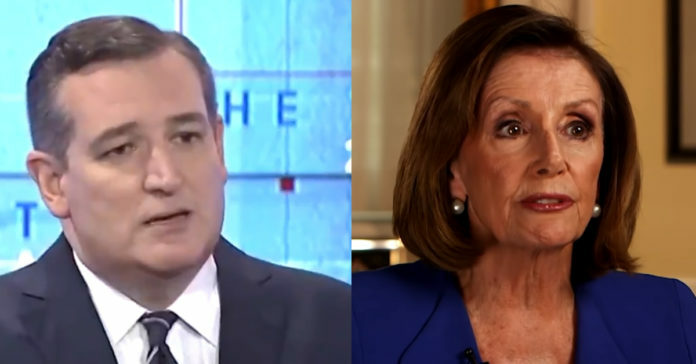 Sen. Ted Cruz (R-Texas) and Rep. Francis Rooney (R-Fla.) today introduced an amendment to the U.S. Constitution to impose term limits on members of Congress. The amendment would limit U.S. senators to two six-year terms and members of the U.S. House of Representatives to three two-year terms. “For too long, members of Congress have abused their power and ignored the will of the American people,” Sen. Cruz said. Francis Rooney stated, “The American people support term limits by an overwhelming margin. I believe that as lawmakers, we should follow the example of our founding fathers, Presidents George Washington and Thomas Jefferson, who refused to consider public service as a career. Trey Gowdy did his best to try to fix in the corruption swamp that is Washington D.C. and he is leaving with his head held high. 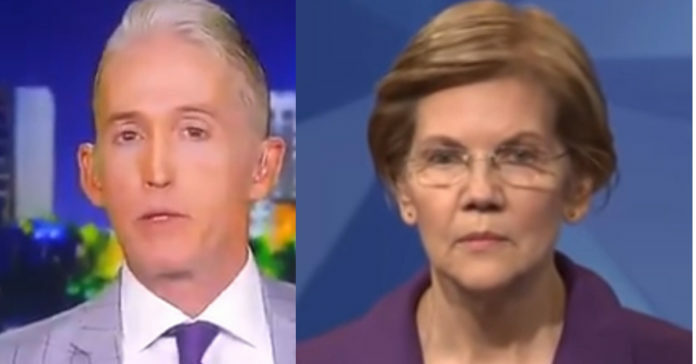 You may have disagreed with Trey over the years, may have hated his tactics to get to the truth, but no one can doubt his integrity and his character – he played it straight and followed corruption where it went – whether it was Democrats or the GOP who was responsible. Enter Liz Warren who is trying to boost her status and get publicity after her presidential launch in Iowa was a total snoozer. So she went after Trey – big mistake.